Alaska’s Inside Passage is synonymous with astounding mountain vistas, blue-green glaciers, crystal clear waters, and pristine wilderness. It wasn’t just the views that compelled two pioneering young women to begin their intrepid adventure along 1,300 nautical miles of coastline. The duo hope to raise awareness for environmental degradation occurring along the coast and bring a voice to thousands of underrepresented communities affected by high-impact industries. Leonie Mahlke, a biological scientist and passionate conservationist, has spent the last seven years working in marine education and outreach in Southeast Alaska. 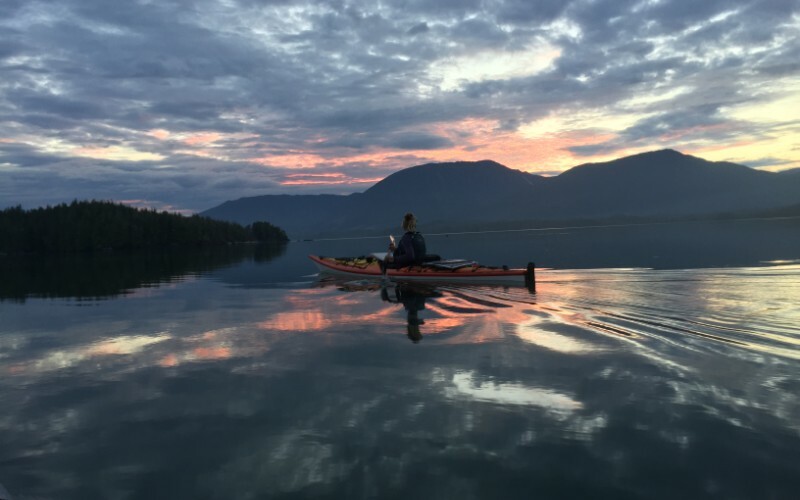 Rebecca Grim spent that time exploring the waterways around Salt Spring Island in British Columbia, honing her yoga skills, and elevating her kayaking prowess to become a Level 1 guide. In this exclusive interview, Grim and Mahlke reveal their favorite gear and candidly implore more women to do “rad things like this” in their everyday lives. Innovation & Tech Today: What inspired the two of you to start this journey through Alaska’s Inside Passage? Rebecca Grim: We started getting together in 2015 and just exploring more along the coast. By exploring, we found out about various issues that were going on around the coast, so we started educating ourselves about what was going on, attending demonstrations, and just taking more action. We were really interested in going on an adventure, but we were also very curious about all these environmental issues, so we thought we should join up and take more time to do this trip. We wanted to explore new places and connect with people. I&T Today: Which environmental issues are most important to you? RG: One of the first demonstrations and large gatherings of kayakers we attended was for a big pipeline that’s coming through. Kinder Morgan is proposing a pipeline and now there are large tankers coming into an area where there are killer whales; it will be devastating when there is an oil spill. Spending so much time on the water and becoming more interested in the coast, we just felt strongly that it’s not a good idea for these tankers to be in these waters. It can be difficult because we don’t want to say that “no oil” is the situation because we use products that have oil in them. Still, the oil industry definitely is a big concern for us. It’s all connected. The tankers, the fish farms, it all has an effect on the ecosystem and environment and it’s all linked together. So you change one piece in the ecosystem and everything is affected. I&T Today: Why have you chosen to focus on meeting with women and indigenous people along the Inside Passage? Leonie Mahlke: We started to see how a lot of the powerful people involved are women so it felt like a natural direction to take. I’m very supportive of women and like to empower women to do rad things like this, so it just felt like a natural direction. The First Nations people who live and work along the coast play a very important role. Some of them are working on fish farms, or are teachers, or are part of the Guardian Watch organization that keeps people safe along the coast. It’s like the Coast Guard, but they’re a little bit more hands on and in tune with the waters. Their life is the coast. And they see the direct effect of these industries and have been here for thousands and thousands of years. So, why not just go to the source and speak with people who have been here from the beginning? I&T Today: How have you incorporated tech into your journey? RG: We have a Panasonic camera, two GoPros, a tripod, and a little microphone that we can attach to the GoPro. We need a quick set up. We also have a shotgun microphone for the Panasonic to use during interviews and also little lavalier microphones. We store everything in dry bags except for the Panasonic camera which is in a pelican case on the deck of my boat. We have two battery banks each, which we recharge with two solar panels that sit on the back of our boats. Leonie Mahlke (left) and Rebecca Grim (right) pose for a selfie during their journey through Alaska’s Inside Passage. I&T Today: What has been your most essential electronic gear? LM: One thing that is not a filming piece, that we use every day, is our Garmin inReach. It allows us to record our mileage, look at our speed, and detect messages. You can even send an email and it has an SOS button. It’s been really helpful just to keep tabs on our mileage as well. We’re pretty loose with our schedule but we also need to do a certain amount of mileage each day. It also has a live tracker so anyone can know where we are. We set waypoints for each camp, so in the future we can look back and see exactly the GPS coordinates of where we camped. Or, if we saw something of interest, we can go back and pinpoint those locations as well. RG: The other cool thing is you can pair it with your phone and download an app so you can actually use your phone to send messages, which is very fun. You can also send Facebook posts out from the remote places and people will see where you are and what you’re doing. LM: Our parents appreciate it [laughs]. I&T Today: Why have you chosen to hammock camp and what are the advantages as opposed to tent camping? LM: Oh my gosh, I can talk your ear off. We are huge fans of the hammock. A lot of the Pacific Northwest coast is rocky with uneven ground, so hammocks give us the ability to camp pretty much anywhere where we can cord those up. We’ve camped on the sides of cliffs and over jagged rock and obviously between trees. It’s a pretty wet environment out here, so it keeps us off the ground. When it’s pouring rain, we’re elevated. We don’t have to worry about water pooling into the tent. It’s just been an amazing system for us. It also creates two different bases for us. We’re great friends, but it’s also nice to have our own individual time away and then one person can be reading or have the light on, like our own little cocoon. So yeah, huge fans of the hammock. I&T Today: What advice would you offer people who want to take a more active role in protecting their watersheds? RG: I would say, don’t be shy about asking questions and approaching people and enjoy it. Exploring is a great way of getting out there and learning about the environment you’re interested in. Also, just be open minded and go for it — have the courage to take the risk. We often hear from people who say they would love to be doing similar trips and have always longed for it, but they’ve never really done it. And what we usually say is, it’s never too late for it. It’s not as big of a deal as everybody thinks and everybody can really do it. And it’s very safe too. The inside passage is very protected and you’re not really taking huge risks. LM: You don’t have to be an athlete or have really expensive gear. I think you just need to have a keenness to get outside. It doesn’t have to be this long, multi-month trip. You can go out for a few days and still feel that feeling of just beautiful wilderness and the connection you have with the environment. We also have these great safety systems in place and know our comfort zone. We can listen to the radio and hear if there is a gale force wind coming in. We’re not huge risk takers. We’ll be like, “Alright, let’s just go ashore and make a pot of coffee,” then just chill and wait for the storm to go by. RG: I think we both would love to encourage anyone else, in particular women, to get outside and just explore. It’s important. LM: Kayaking is such a nice way of exploring as well. The level you are on is so cool because you’re not just on the ocean, not just on land, but you are going along the shore while on the water, so it is really cool to connect with both. It’s a really cool perspective, and you are going slow too, so you’re not rushing, which is really nice because it gives you time to just be in the moment on the water.